Convex Mirrors | In Stock For Fast Delivery! Order Today! 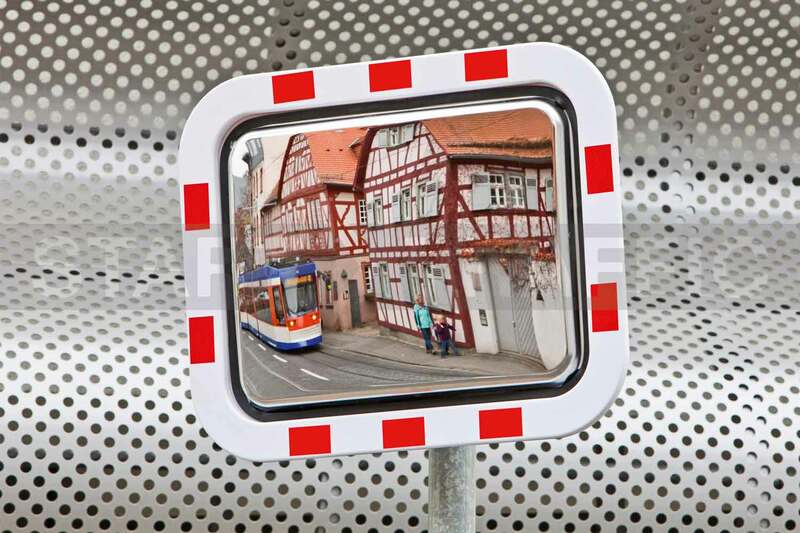 Our range of safety mirrors will ensure that you have excellent visibility wherever you are. Convex mirrors are used across almost all industries. The curvature on these mirrors expands the field of vision allowing blind spots to be seen with ease. The key function of these mirrors is to improve safety and security around them. This may be at a hospital, allowing people to see around blind corridor corners. In a warehouse where forklifts operate in narrow racking rows. Or on a busy main road where hedges obscure the view from a driveway. Our comprehensive range of mirrors is made from a variety of materials including glass, stainless steel and even acrylic. Which type of material is best suited will depend on where you intend to install them. Preventing pedestrians from walking into the path of vehicles. Allowing machine operators to see behind the machine, or behind themselves. Allowing vehicle checkpoint staff to see the back of a vehicle without moving from the front. Assisting drivers seeing oncoming traffic when pulling out of driveways. As there are so many types of convex safety mirrors available we have broken them down into several key categories. 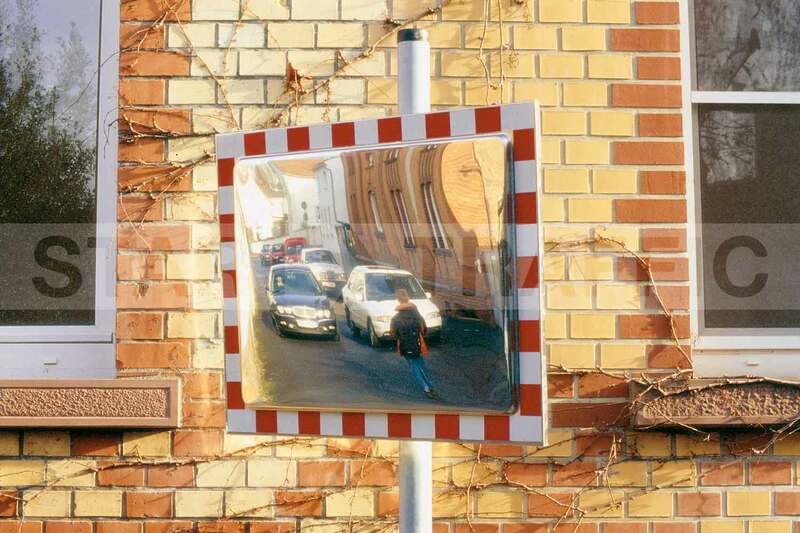 Traffic Mirrors are used mainly on the road, on blind corners. They will generally have red and white striping around the outside to draw attention to them. Some of the mirrors in this range will have “anti-frost” and “anti-condensation” functions. 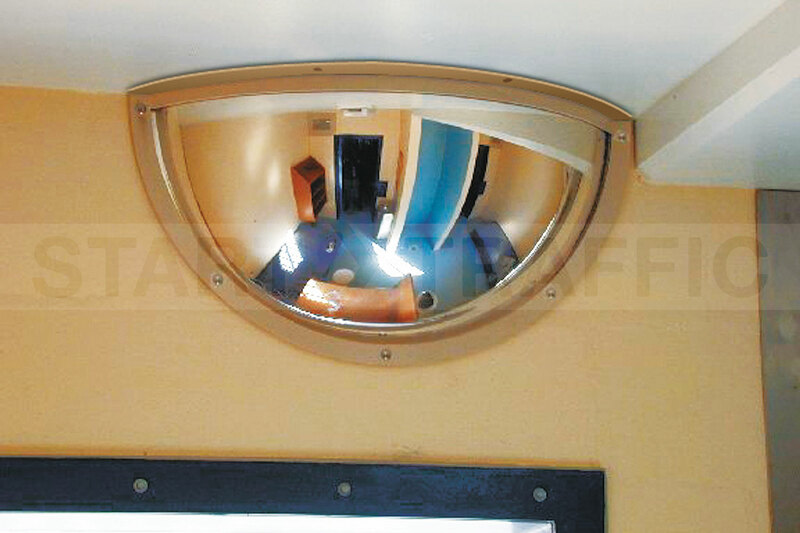 Security Mirrors are used in shops and even in prisons to eliminate blind spots. They come with a variety of fixing brackets including magnetic attachment. Inspection Mirrors are used to look behind machinery or provide a view into otherwise hard to see areas. Driveway mirrors are similar to traffic mirrors but usually, feature a rain deflector. 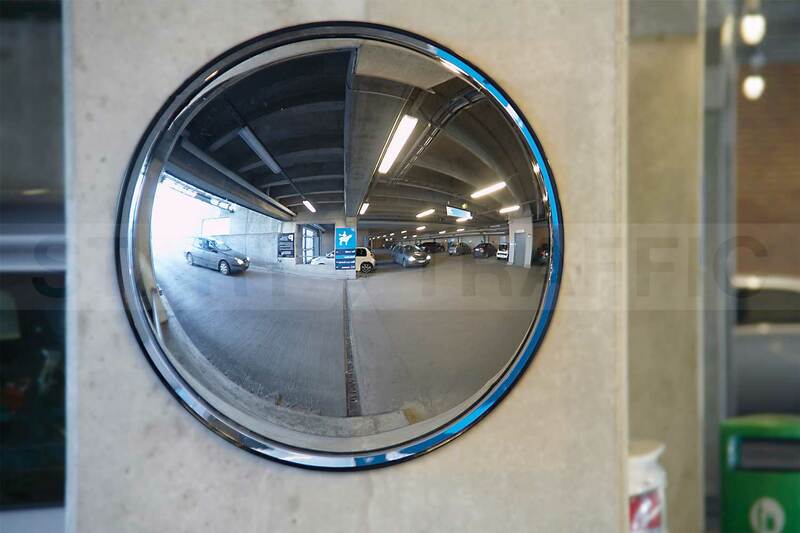 This type of mirror is also frequently seen in car parks. Anti Vandal Mirrors, The reflective surface on these mirrors is made from stainless steel making them hard to deface. 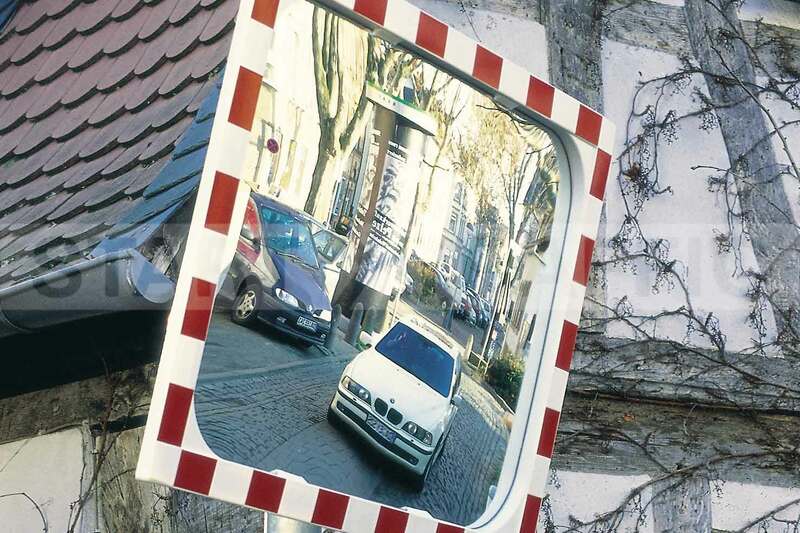 Blind Spot Mirrors can be used in factories, offices or almost any location. These mirrors offer good 360, 180 or 90 vision around the viewer. What Size of Convex Mirror Do I Need? Getting the right size of the mirror is critical, get one too big and the mirror may get in the way. If you get a mirror that is too small won't allow enough visibility. A good rule is the larger viewing area, the larger the mirror. Most of our mirrors include an indication of maximum viewing distance. This indicates how far from the mirror the optimal viewing distance is before the image becomes too small. Care should be taken to ensure that the mirror chosen is also not too deep, especially when buying a wall mirror. Choosing a mirror that is too deep can lead to it being hit by passing vehicles. Where Can Our Mirrors Be Used? Outdoor mirrors are made to resist the elements and can be subjected to cold, wet and windy weather without damage. This makes them suitable for use in car parks, at airports, security checkpoints and on roads. The Spion and detective-x range of observation mirrors are ideal for use in warehouses, factories, shops and supermarkets. Our anti-vandal mirrors are ideal for “high risk” applications. They are supplied with security fixings and durable anti-scratch stainless steel reflective surfaces. 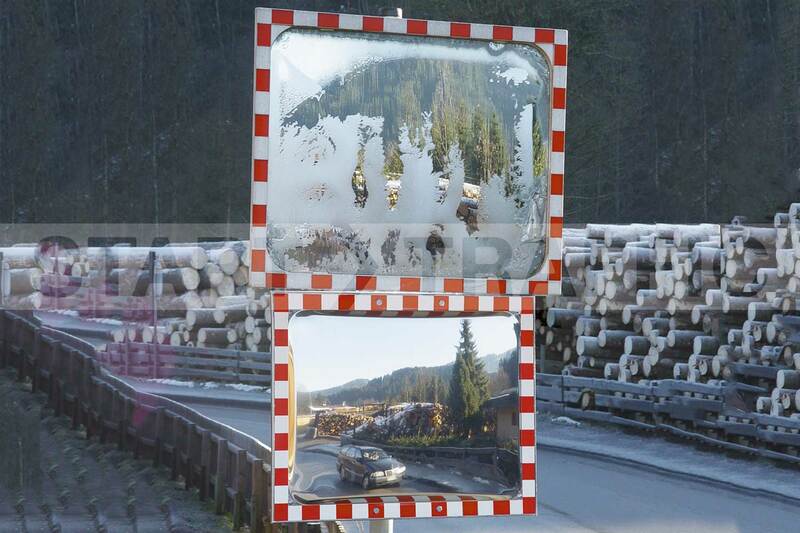 Where mirrors are likely to be subjected to freezing conditions our anti-frost and fog mirrors should be considered. Look for the icefree specification or mirrors with a heating element. What Are Our Mirrors Made From? There are three key materials that the safety mirrors we supply are made from, each has its benefits and disadvantages. Stainless Steel Mirrors are ideal for areas where a fragile material cannot be used. Stainless steel mirrors are hard wearing and scratch resistant. These mirrors are cost-effective and durable. They are scratch resistant and shock resistant unless otherwise stated. These are great for areas where the mirror cannot be located “out of the way. When the ultimate concern is the optical quality of the reflection a glass mirror is the best choice. The tradeoff is that glass is fragile so the mirror will need to keep the mirror out of harm's way. How Do You Clean Safety Mirrors? Cleaning and caring for your mirror is a simple process. For the most part, they will need very little maintenance. Outdoor mirrors will need cleaning with soapy water and a microfibre cloth from time to time. The important part when cleaning these mirrors is to remove any debris that can cause scratches such as mud and road grime using water before wiping with a cloth. Once the mirror has been cleaned with soapy water use a dry microfibre cloth to remove any moisture from the surface of the mirror. This will keep the image clarity at its best. How Are Safety Mirrors Installed? All our mirrors are available with fitting kits. These fitting kits allow you to install the mirror onto walls, posts or hang them from the ceiling. Which fitting kit is best suited will depend on which mirror you are purchasing. Many of our mirrors have the fitting kit and fixings included. If this is not the case it will be made clear on the product page. No, however convex and concave are commonly mixed up terms. These safety mirrors are almost all convex. Convex mirrors widen the angle of view, whilst concave mirrors narrow the view. Within Reason the more convex a mirror the better the view that you will have. Some of our mirrors are available in flat formats! We are experienced retailers of safety equipment and are happy to help with any questions that you may have about buying convex mirrors in the UK. You can get all of your safety equipment including mirrors of course in one place. If you need any assistance or are struggling to find the right safety mirror then simply pick up the phone and give us a call. Our sales team is available during office hours and will be happy to assist you on 01905 794 875.